The more one looks the more one can admire rather than love the artist's passionate exactitude. 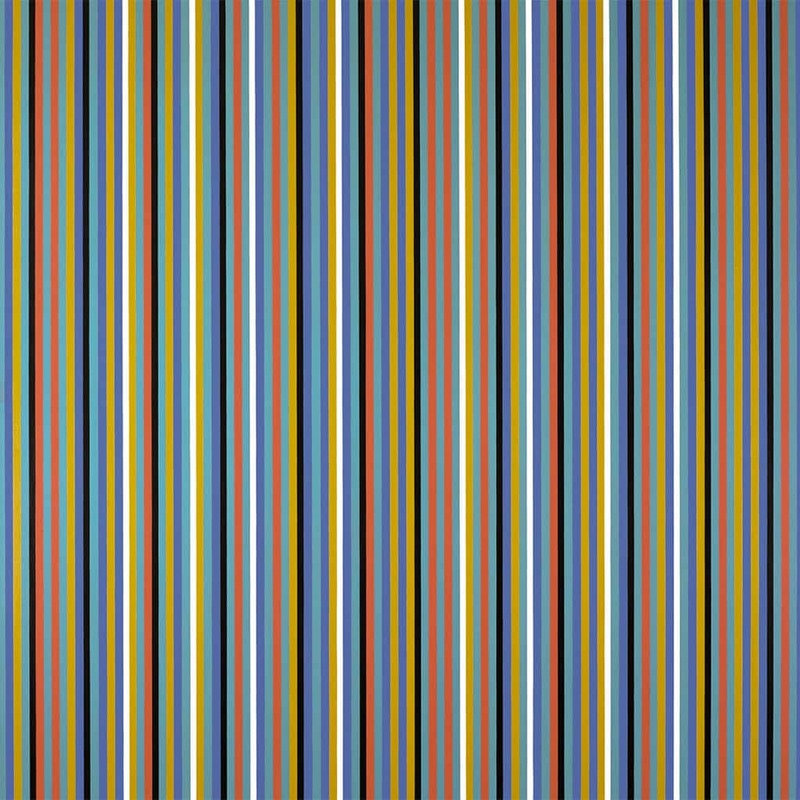 Bridget Riley’s mural for St Mary’s Hospital in Paddington, which was unveiled in April this year, is something I’ve seen only in photographs. And on seeing it for the first time my reaction, I’m afraid, was, “Oh no”. It obviously didn’t help that the photographer had wildly exaggerated the one-point perspective, so that the parallel lines of two facing walls converging sharply made you feel the vertiginous pull of a rabbit hole. Those zingy pink, green, yellow and white horizontal lines running the length of a long, brightly lit corridor – like a stick of Blackpool Rock – made me a little queasy. And walls appearing to close in on you as you’re being wheeled to a trauma unit didn’t seem too clever. But that was a photograph. Riley’s paintings don’t reproduce at all well, though it’s usually the case that in reproduction they lose, rather than gain, their nausea-inducing potential. The optical effects employed in her canvases which make it very difficult for the eye to focus are another matter. You get a hint of their effects in reproduction, but it’s nothing like the experience of standing in front of an actual painting. Today she’s much more interested in colour as a way to flood the senses rather than disorientate them. Riley has used an array of geometrical forms in her pursuit of vibrating movement. But the stripes – horizontal, vertical, diagonal – have been consistent throughout her long career (she’s a surprisingly youthful and energetic 83). This exhibition consists of 15 stripe paintings, as well as studies on paper, beginning, though it’s by no means a chronological hang, with the 1961 Horizontal Vibration. This was painted in the year Riley abandoned figuration altogether, producing a number of black and white Op-art paintings, including the better-known Movement in Squares, whose black and white checks are painted as if the canvas is curving and dipping at the vertical point of the golden section. In Horizontal Vibration a similar concertinaed effect is achieved by painting black bands in various densities and differing proximities to one another, creating a dense blur that runs horizontally through the centre of the canvas. The effect is literally dazzling, the lines undulating like a hypnotic sea current. One often thinks of things in nature for Riley’s abstractions, and she herself frequently titles her work with an eye on the natural world, though I admit I also can’t help thinking of sweets – humbugs, liquorice candies, a stick of that Blackpool Rock. Either way, your gaze searches for a resting point but there’s no purchase. By 1967, Riley had moved into colour, beginning her soft transition via a series of paintings using subtle colours – gradations of grey. By the time she comes to paint her huge 1969 canvas Late Morning (Horizontal) bright complementary colours, these separated by bars of blazing white in rhythmic formation, have fully superseded the smoky monochrome effect. One thinks naturally of Dan Flavin’s fluorescent tubes when confronted by the diagonals (purple, green, orange, white) of the diptych Prairie, 2003/1973. And one thinks too of James Turrell, the Californian light artist, for what Riley achieves with paint others have only achieved with the immersive optical effects of coloured light. Her works seen in series feels less a display of individual paintings than an immersive installation which affects a build-up of physical responses. I’m not sure if I can ever be moved by Riley, but she’s an artist one can certainly deeply admire, in that way that Seurat, with his scientific investigations in to colour and his deep knowledge of the way spots and dashes of unmixed pigments interact by a process of optical mixing at an optimum distance, is deeply admired but just a little less loved. Though her colours shimmer and burn on the retina, she doesn’t produce the joy of a Matissenor a kind of sublime transcendence of a color field painter like Rothko. But the more one looks the more one admires her passionate exactitude. This review first appeared in The Arts Desk on 27 June, 2014.